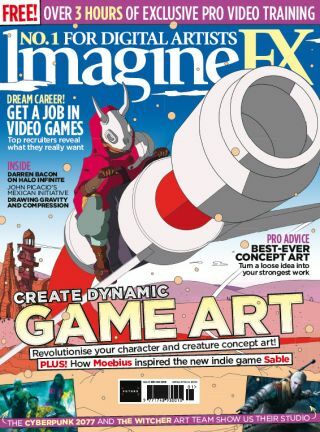 Learn how to break into the games industry and revolutionise your character and creature concept art with the latest issue of ImagineFX magazine – which goes on sale in the UK today. Packed inside the pages of issue 169 you'll hear from top creatives and art directors in the industry, who are all raring to share their career-shaping insights. So if you've always dreamt of designing worlds and characters for AAA titles, be sure to pick it up! Elsewhere in issue 169, Patrick J Jones continues his detailed figure drawing workshop. This time he reveals how compression and gravity effects can be used to create more realistic looking bodies. Meanwhile, Shedworks co-founder Gregorios Kythreotis shares how to use Unity, Photoshop, Procreate and Maya LT to create a fresh approach to video game art in our cover art feature. There's also the latest news from the digital art world, plus reviews of books and tools that you need to check out. Make sure you don't miss it! Plenty of artists want to break into the world of designing for games, but fewer turn that ambition into a reality. We hear from recruiters in the field about what they're looking for in a portfolio and how you should go about grabbing their attention. From how to go about making yourself known online to good convention etiquette, this feature gives you the low-down. Polish games studio CD Projekt Red is perhaps best known for its fantasy RPG, The Witcher. As with lots of fantasy properties, the success of this series is built by the investment of the fans. We visit the studio to hear how it works and creates products that keeps its players happy, as well as how it runs on a pinch of creative chaos. Halo's lead concept artist Darren Bacon shares his story this month in our artist's portfolio. He talks about the principals of good game design, the make or break moment that defined his career, and how he achieves the final five per cent that separates the good art from the great. Oils paints can be an intimidating medium to work with, but thanks to this tutorial by Howard Lyon you'll learn how to harness oils to produce a portrait with an academic approach. Covering everything from tools to painting techniques, you'll be creating portraits worthy of the masters in no time. Got an idea for a piece of concept art but don't know how to take it to the next level? Lucas Staniec syas that it's all about having the right mindset, not the right artistic skills. Learn how to hone this elusive mindset with his in-depth tutorial for developing elements of a piece of concept art.